At your individual health information sessions you will have time with three health professionals: a diabetes educator, a dietitian and an exercise physiologist. You will have the opportunity to discuss your general diabetes concerns and you will be given resources to support your diabetes management. Bring your blood glucose meter and test strips with you and we’ll clean your meter and check its accuracy. Date: Friday 2 September 2016. Time: 45 minute appointment between 9:30am and 3:45pm. Where: The Ranch Hotel, Cnr Epping & Herring Rd, North Ryde. 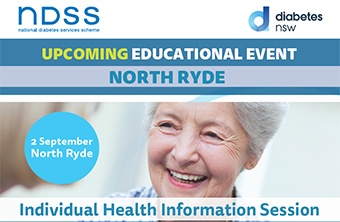 These programs are FREE for NDSS registrants. Visit diabetesnsw.com.au for more information. Limited spaces available and bookings are essential. Call 1300 136 588 to book now!